We told you that WE tv is bringing the hit sitcom Will & Grace to its line-up this fall, but now Logo will also. In a shared deal with WE tv, Logo will launch the series on Saturday, Sept. 21, 2013 with an all-day sitcom event from 6am-10pm featuring all three of Logo's off-network sitcoms: Roseanne, The Golden Girls and now Will & Grace. More sitcom fun will air on Sunday, Sept. 22 from 6am-6:30pm with Roseanne and Will & Grace sharing the action. Starting Monday, Sept. 23, Logo will air Will & Grace regularly weekdays from 5-7pm and 11pm-1am. Logo's other sitcoms will still air weekdays, too. Roseanne will air on most weekdays from 2-5pm, while The Golden Girls will air Fridays from 7-11pm and Saturdays from 3-7pm. Will & Grace and Roseanne will air on Saturdays too, with timings varying. The rest of the line-up is filled with reality series and movies, but The L Word and Daria air mostly in late nights or early mornings from time to time. That's all that is really to report for Logo, but stay with us for continued updates. 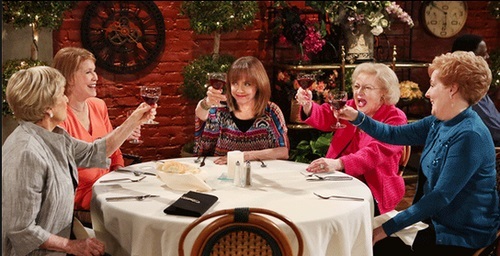 TV Land's Hot in Cleveland drew in over 2.5 million total viewers for its historic The Mary Tyler Moore Show reunion at 10pm and more than 2.5 million for its cliffhanger finale at 10:30pm (Source: Nielsen, 9/4/13, L+3). The highly-anticipated Mary Tyler Moore reunion garnered the most total viewers for Hot in Cleveland since March 2012 on a Live+3 basis. Both episodes originally premiered on Wednesday, September 4. The Live+Same Say ratings for both episodes were solid as well with the 10pm airing doing 1,753,260 total viewers and 1,903,913 total viewers for the 10:30pm airing. The key Adults 25-54 demographic was solid as well with a 0.61 and a 0.70 rating. Same day encore airings in the 1am hour garnered 711,363 total viewers (0.27 A25-54 rating) and 657,009 total viewers (0.26 A25-54 rating). With the inclusion of three-day DVR playback, the 10pm and the 10:30pm episodes each scored a 1.1 rating in TV Land's target demographic of Adults 25-54, the highest ratings since the live season premiere (Source: Nielsen, 9/4/13, L+3*). Among Women 25-54, the 10pm posted a 1.3 rating and the 10:30pm went up to a 1.4 rating, also the best since the live season premiere in June. The 10pm episode popped for Men 25-54 as well, hitting a 1.0 rating, the best for the show since August 2011. Overall, the 10:30pm finale saw double digit increases with the episode up +70% among Adults 25-54 versus the winter finale. (*All statements from Nielsen, 9/4/13, L+3). This summer season of Hot in Cleveland was up +16% versus the winter season among Adults 25-54 (Source: Nielsen, Most Current: L+7 6/19/13-8/21/13; L+3 8/28/13-9/4/13). This comes as TV Land also saw double digit growth for its series The Exes versus its prior season, up +21% for Adults 25-54 (Source: Nielsen, Most Current: L+7 6/19/13-8/21/13; L+3 8/28/13). ABC Family also had success with its finales on Wednesday. At 8 o'clock, the season finale of Melissa & Joey set season highs in Total Viewers (1,125,395), Adults 18-49 (704,000/0.55 rating), Women 18-49 (471,000/0.7 rating), Viewers 12-34 (589,000/0.6 rating) and Females 12-34 (400,000/0.9 rating), and to a 7-week high in Adults 18-34 (423,000/0.6 rating). Based on a full week of viewing, Melissa & Joey spikes by 52% in Total Viewers (1.4 million vs. 923,000), by 61% in Adults 18-34 (550,000 vs. 341,000), by 56% in Adults 18-49 (890,000 vs. 569,000) and by 57% in Viewers 12-34 (696,000 vs. 443,000). At 8:30 pm, the summer finale of Baby Daddy surged to season highs in Total Viewers (1,278,911), Adults 18-34 (502,000/0.7 rating), Adults 18-49 (801,000/0.63 rating), Women 18-49 (497,000/0.8 rating), Viewers 12-34 (693,000/0.8 rating) and Females 12-34 (446,000/1.0 rating), soaring by double digits week to week and over its Melissa & Joey lead in. Based on Live + 7 ratings, Baby Daddy surges by 60% in Total Viewers (1.4 million vs. 877,000), by 82% in Adults 18-34 (581,000 vs. 320,000), by 64% in Adults 18-49 (847,000 vs. 518,000) and by 71% in Viewers 12-34 (763,000 vs. 445,000).